Yesterday we resolved all the notes of the C major scale against a C major chord. You might, on a very rainy day, like to think of the notes C, E and G as being the sun, and all the other notes are being pulled towards it. Or maybe CEG is the Death Star and DFAB is the Millennium Falcon caught in a tractor beam. Or maybe not. 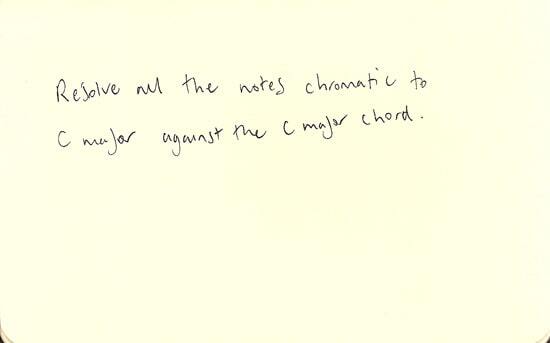 Anyhow, now you need to do the same thing for all the notes not in C major. That’d be Db Eb Gb Ab Bb. On the piano that’d be all the black notes. Db wants to move down to C.
Eb wants to move up to E.
Gb wants to move up to G.
Ab wants to move down to G.
Bb could either go up a tone to C, or down to A. If you change the chord to C∆ then the Bb might sound better going up to B. Now think of the underlying chord as G7 resolving to C, and resolve the notes across that chord change. i.e., Play G7 and play a Db note, then when you change the chord to C, resolve the Db how you feel it. C or D.
You’ll notice that you’ve got a B triad over G7, and the B triad zips up to C triad. Also note that the chromatic notes make a major pentatonic scale from Gb (a tritone away from C), or Eb minor pentatonic, if you’re that way inclined. Also note that you could think of the altered scale like this: (for G7alt) root, 3rd & 7th + All the notes not in the home key of C major (apart from the Gb). Or if you abandon the root and use the major seventh instead, then you have a Gb major scale to use over G altered. Or Ab dorian, however you want to think of it. Also note you could switch between C and Gb major to get that feeling of I to V7alt to I, etc. Also note the resolutions are all semi-tone resolutions. F and B on G7 resolve to E and C on C major, and the chromatic notes can all resolve by a semi-tone, too. So, maybe think about resolving tones. Or avoiding semi-tones in resolutions.